← HIGHLY RECOMMENDED: Domaine Juliette Avril 2009 Châteauneuf-du-Pape, Southern Rhone. 14.5% ABV, $30-55. 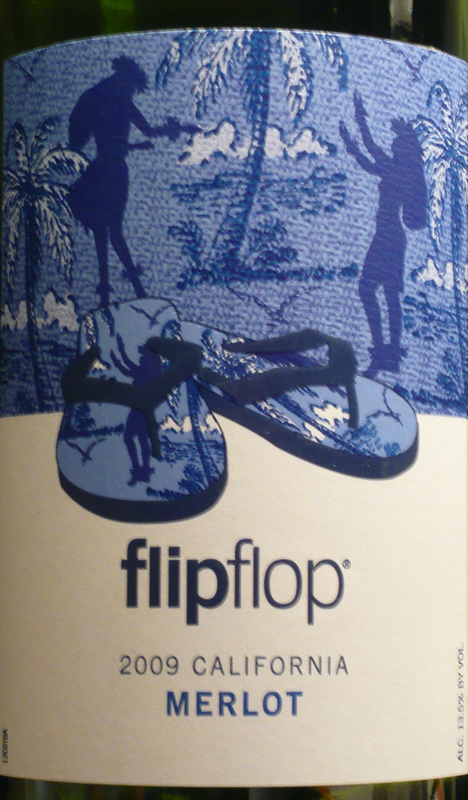 RECOMMENDED: Flipflop 2009 Merlot, California. 13.5% ABV, $4.99. Wow, what a great little wine. By “little” I mean the price tag. APPEARANCE: Ruby garnet with clarity. NOSE: Bright and beautiful, with high notes reminiscent of a good Petite Sirah as well as the depth that a Merlot should exhibit. Baking spices, oak, plum. TASTE: Matches the nose. Just a delightful wine. It tastes much more expensive than it is. Smooth, cherry notes, a tiny bit of tea. FINISH: Smooth and gentle, not particularly long. Besides the excellent Pinot Grigio reviewed in the link above, the Riesling and Pinot Noir (also reviewed in 2011) are quite pleasant. The Cabernet Sauvignon is fairly good and the Chardonnay is very satisfactory if you like the oaky style and want to spend just … $4.99. We haven’t tried the Moscato or their new Sweet Red. LABEL NOTES: Medium-bodied, silky Merlot with plum and mocha notes, soft tannins and a balanced, luscious finish. Jammy aromas and soft tannins pair well with Texas chili, black and blue sliders or cheddar cheese broccoli. Serve at room temperature now or store away from direct sunlight for up to 3 years after purchase. This entry was posted in California, Merlot. Bookmark the permalink.